But actually getting a hold of naloxone can be difficult. Many pharmacies and local health departments don’t stock it, and not everyone can afford it. Every state and Washington, D.C. have passed laws to increase naloxone access for friends and family members of people who use drugs or bystanders. Davis found that most states allow third-party prescriptions which let doctors prescribe naloxone to someone other than the person at risk of an overdose. Many states also allow doctors to issue standing orders to pharmacies to dispense naloxone to anyone meeting certain criteria, such as having a substance use disorder. 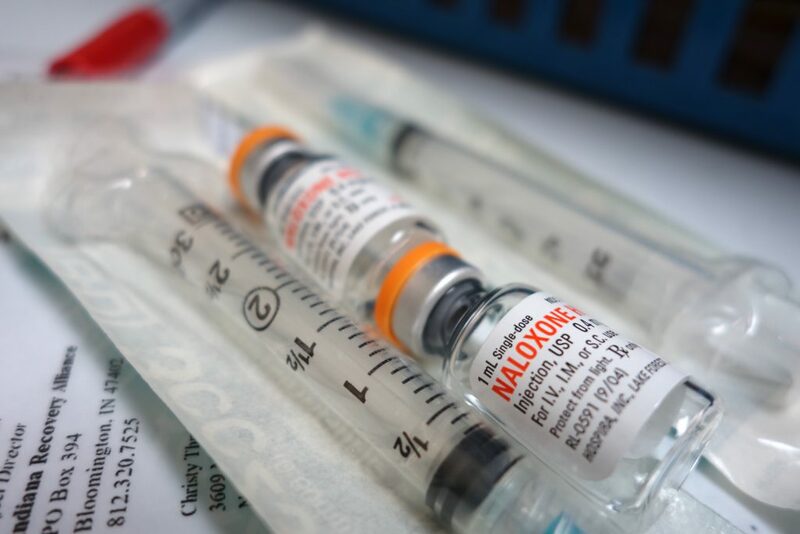 And organizations such as non-profit groups or local health departments can also dispense naloxone in many states, a process known as lay distribution. Some states, including Jerome Adams’ home state of Indiana, have issued state-wide standing orders. Indiana allows pharmacies, local health departments or nonprofits that register with the state and follow certain requirements to dispense the drug to anyone walking in their doors. Hoping to prevent other parents from losing a child to an overdose, she started Overdose Lifeline and pushed lawmakers to pass a law, dubbed Aaron’s Law, allowing for third-party prescription and ultimately the statewide standing order. It was first enacted in 2015 and Jerome Adams signed Indiana’s standing order in 2016 while serving at the state’s health commissioner. But Philips said two years later, many people are still unaware of the law, including pharmacists, which is important: Pharmacies must register with the Indiana State Department of Health to dispense naloxone under the statewide standing order. Only about half of them do. According to the Indiana Professional Licensing Agency, there are 1,364 active pharmacies in Indiana. Information posted by ISDH shows that 628 of those are registered to dispense naloxone. A spokesperson for ISDH wrote in an email that 115 Wal-Mart pharmacies were missing from that total because they hadn’t yet completed their 2017 reports. For people who can’t afford the drug, Ray said government and nonprofits can help. Indiana’s health department used federal and state funds to purchase nearly 14,000 naloxone kits since 2016, the state reported. The state distributes those free doses through county health departments. But nearly half of Indiana counties didn’t request kits. Those that did distributed the vast majority of the kits to first responders. Research from Indiana University’s Fairbanks School of Public Health also found that many doses intended for lay responders were actually handed out to first responders, perhaps because of shortages among emergency services agencies. The county health departments that participate, Justin Phillips said, need to work hard to get naloxone to people who might use it. People who use drugs, after all, may not feel comfortable going to the government for naloxone. But although the state legalized such programs in 2015, counties have struggled to launch and maintain them. There are currently eight syringe exchange programs operating in the state.